Our nation was founded on Biblical principles, but we have lost sight of this in today’s culture. That is why we are calling all Christ-followers to join together on November 19, 2011 to host the One Nation Under God Event in homes and churches across America. This event will include a DVD video presentation to educate and bring people to a common understanding: That America is a nation originally intended to bring honor to Jehovah God, the God of the Bible. It will also be made available via web stream on MorningStar TV at www.morningstartv.com and the Oak Channel. Join Us on Nov. 19, or Click here to host your own event! 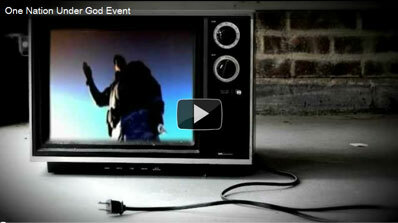 One Nation Under God Event promotional video. In this powerful 2-hour event, the truth about the Biblical foundation of our nation will be explored by spiritual, political, and educational leaders such as Dr. James Dobson, Bob McEwen, David Barton, Newt Gingrich, and more! We are asking Christ followers across the US to step out in faith, sign up to host, then simply invite your friends and family to join you on or after November 12, to learn more about our nation and how we as Christians are called to make our voices heard. We will supply you with invitations, timelines, and action checklists to ensure your house party or church event is a success. MorningStar's event will be on November 19th - when will you host yours at a home group or at church? to learn more and sign up to host today!